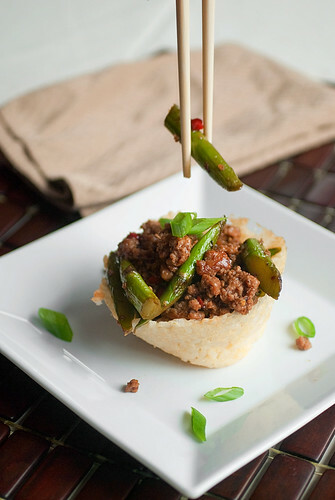 I ended up making bowls out of rice and filling them with a pork and asparagus stir-fry. I really loved the way the bowls came out. The outside of the rice cooked up a little toasty and nutty while the inside was still soft and slightly sticky, so it added a nice textural contrast to the dish. Any stir-fry would be great, but with spring veggies popping up everywhere this tasted just right. 1. In a medium bowl, whisk together 1 Tbsp soy sauce, wine and cornstarch until combined. Add the pork and mix gently to incorporate. 2. Heat 2 tsp oil in a wok or large skillet over high heat. Add the asparagus, jalapeno and ginger and cook, stirring frequently, until the asparagus is softening but still crispy, about 3 minutes. Transfer to a small bowl. 3. Add the remaining 1 tsp oil to the pan. Add the pork mixture and cook until browned, breaking up the meat into chunks, about 2 minutes. Add the asparagus back to the pan as well as the remaining 1 Tbsp soy sauce, oyster sauce, honey and orange juice. Cook until the pork is no longer pink, about 2 minutes. Remove from heat and mix in the green onions. 1. Preheat oven to 350F. In a medium bowl mix the rice, sriracha and salt to taste. Gently mix in the egg white until it is well incorporated. 2. Generously spray a jumbo muffin tin with cooking spray (even if it's non-stick!). Add 1/2 a cup of the rice mixture to 4 of the muffin cups and pack it down onto the bottom and up the sides of the tin. Bake for about 20 minutes, or until the rice begins to brown lightly. 3. Allow to cool in the tins for 5 minutes. 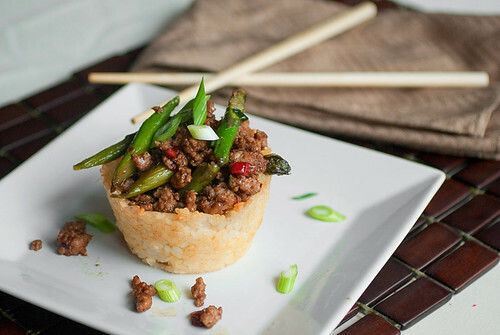 Gently remove the rice bowls onto plates and fill with the stir-fry! That looks very good. Nice presentation and the bowls do sound like they would taste as good as they look with the stir-fry. Thank for the recipe for making the rice bowls looks simple and tasty. And the filling sounds delicious! Great plating as well great work. Gorgeous rice bowls! I know what you mean about having the ideas overflow. You did a great job! The rice bowl is a great idea! I'll have to try it! What a fun idea to dress up dinner. This is a fantastic idea. I had sushi rice at home and yet it never clicked me :) This can me great meal ! I love how you got the rice so golden for those cups, and the filling, OMG, so delectable! Beautifully done! Just wonderful! The combination you chose sounds delicious and the rice bowls are on my to do list! Great job, and thanks for participating! Amazing pictures and presentation..I'm bookmarking this..
Beautiful and it sounds very tasty! Great job! Can't wait to see the next one you make! !